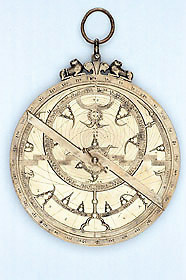 This astrolabe has some interesting decorative features. One is the combination of a fleur-de-lis and two lions forming the throne. Each lion is looking backwards and has its tail stretched across its back. There is a similar throne on an astrolabe included in a Flemish painting from the early 17th century, now in the National Gallery, London. The rete on this instrument is particularly fine, with the star pointers elegantly mounted, the arrangement of circles and links well designed and executed, and the lettering very fine. Especially charming are the six pointers shaped and engraved in the form of birds with long beaks.